Another wonderful day...until it was time to stop for the night. 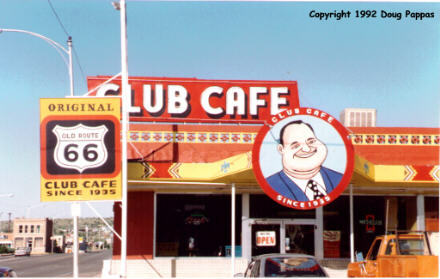 After staying at the Blue Swallow, there was only one place I could possibly have eaten breakfast: the Club Cafe in Santa Rosa, of course, home of the Fat Man. Most of the billboards are down now, but in addition to a good breakfast I was able to pick up a postcard and -- something new -- a Route 66 coloring book! Originally I'd bought it as a gift for Geoffrey Barnes, but quickly decided it wasn't going anywhere except onto my shelf. Made good time all morning, since except for the inevitable stops at numerous Stuckey's and Clines Corners (none of which had any decent postcards to add to my collection), I spent most of the time on the Interstate. In Albuquerque, I turned south to follow one of the road's older alignments across the Laguna Pueblo. 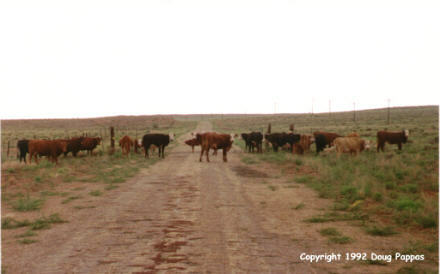 By western New Mexico, though, the incessant hunt for the perfect souvenir was slowing me down -- between Grants and Winslow, AZ, there are probably 20 "trading posts" or other tourist traps at which to stop. 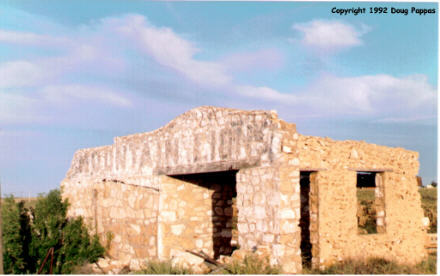 I was selective enough to skip one or two of them... As I crossed into Arizona, the guide to eastern Arizona in the Mother Road News I'd received in Illinois proved invaluable; it guided me down a couple of dirt roads/dead ends to very photogenic ruins of former tourist businesses. The Route 66 shop in Holbrook had unfortunately closed...but the Wigwam Village was back, better than ever with air conditioning and other modern amenities amidst the 16 tepees! The ultimate photogenic ruin, though, came in Two Guns. A fence blocked access to the burned-out remnants of an old roadside menagerie/gas station/tourist trap; I parked near the fence and was just walking down the path when an armed guard ordered me to stop. Turns out the Two Guns property was sold a couple of months ago to a Route 66 fanatic with tons of money, who's planning to fix up the area around the ruins and open everything to the public by early next year. For now, he was glad to give me a tour of the place for $5.00 -- one of the best investments I've made on the road! Camera and camcorder in hand, I followed him to the edge of a cave that will soon reopen for tourists, through the ruins of an old fort and the former menagerie, and along two separate paths of old Route 66, both now unpaved. We wandered for over an hour; then he gave me some Western literature and asked me to sign the guest book. I was the 25th tour guest in the past couple of months; the others came from all over, including Alabama, Oregon, California, Connecticut, Pennsylvania, and even Britain and Italy! Really hope this idea works out... Then continued on to Flagstaff for the night.